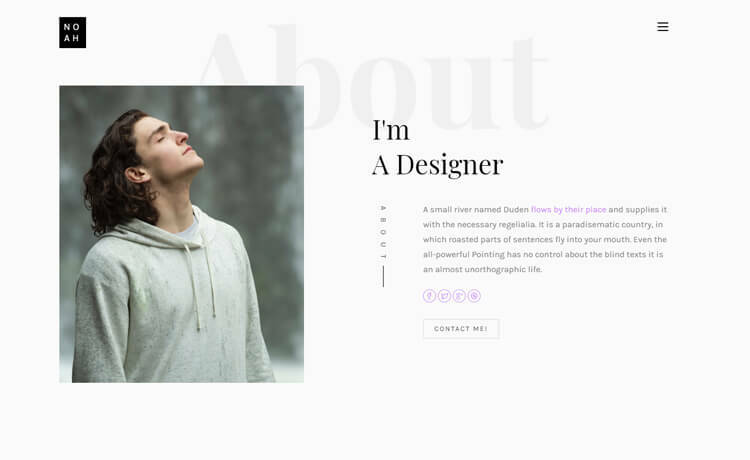 Noah is a free HTML5 personal landing page template. It is laden with cutting-edge features and assets, for instance- off-canvas side navigation, search box, image slide-show, ghost button, on hover effect, load on scroll animation, fun fact counters, testimonials to name a few. Noah is a free HTML5 personal landing page template based on Bootstrap framework. It is a beautiful theme for personal portfolio, personal blog or personal resume website. Moreover, Noah has an artistic look with a nice, simple, clean and minimal design. This mobile-ready theme is a multi-page template as well as optimized for maximum browsers. Besides, Noah is laden with cutting-edge features and assets, for instance- off-canvas side navigation, search box, image slide-show, ghost button, on hover effect, load on scroll animation, fun fact counters, testimonials to name a few. Noah comes with very flexible and highly alterable code structure inside the box, so, creating with Noah would be an excellent experience. Thank you for downloading Noah.